Last summer there were a spate of articles documenting the sometimes latent and often blatant antipathy that many Chinese feel toward people of African descent. In Foreign Policy, Fulbright Scholar Viola Rothschild described her findings while conducting research on African entrepreneurs in China. Ayo Awokoya offered this cogent exposition of anti-African racism on line in China. Promotional posters for Star Wars: The Force Awakens were modified in China to minimize or eliminate non-white actors. 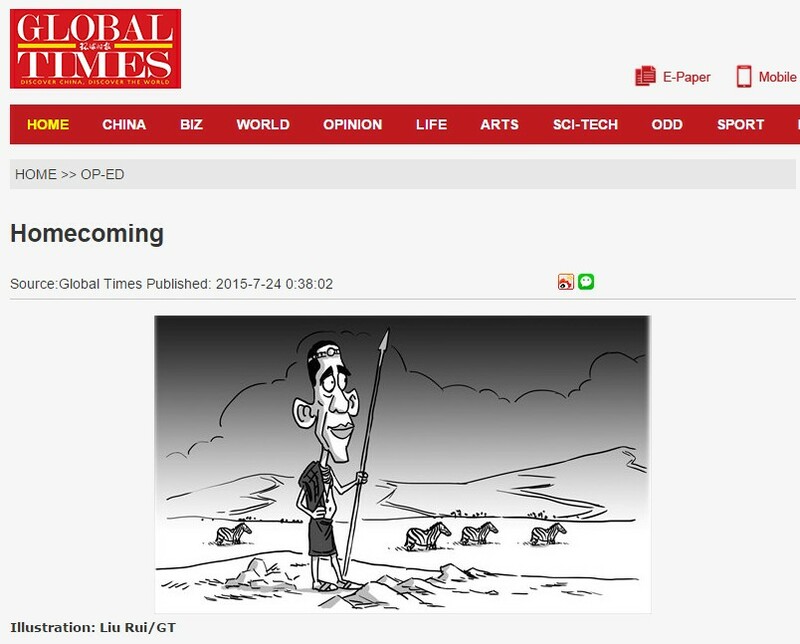 And shrill government mouthpiece Global Times published a cartoon showing President Obama in a way that would, in the United States, be beyond the ken for even those publications in most vigorous opposition to the President. My point is not to suggest that China is alone in its attitudes – indeed, the candidacy of Donald Trump in the current U.S. Presidential campaign has demonstrated that America is far from ridding itself of ethnic hatreds. Rather, it is to highlight several important points around the dialogue of China and its role in the world. Finally, that neither the Chinese nor the peoples around the world with whom they have increasing contact have yet to reckon with that racism, its policy implications, and its potential impact on the world as a whole. As China emerges as an international power, it faces the danger that latent racism in its relations with other countries will undermine its efforts to win friends beyond its borders. Veteran journalist Howard French, author of China’s Second Continent: How a Million Migrants are Building a New Empire in Africa, notes that Chinese operating in Africa are racist to the point that they are unconscious of the aspects of their behavior and speech that cause offense. Provoking local resentment, though, is only the beginning of the dangers implicit in Chinese racism. Racism can fester all too easily into the kind of cultural chauvinism that propelled the worst elements of Japan’s foreign policy between 1868 and 1945. For the sake of both the nation and the world, China cannot be allowed to fall into that trap. The example of Japan – and those of the great European empires – offers a surfeit of reasons to fear a world power convinced of its own ethnic superiority. One friend suggested to me that authoritarian regimes are naturally less racist. Even if we leave aside the extreme systemic racism of the USSR and the Third Reich, one would be hard pressed to prove that authoritarian regimes are better at eliminating de facto racism (or what I call “social racism”) than their pluralist counterparts. As the articles linked above attest, there is certainly social racism in China. And as for systemic racism in China, one need explore no further than its immigration policy, which makes attaining citizenship in China fairly straightforward for an ethnic Chinese applicant, but practically impossible for a caucasian, an African, or a Latino. If we are going to call out our own governments and institutions for their racist behavior, we cannot afford to give other governments a pass. This is not imposing our standards or culture on another: it is, rather, compelling China to eschew a behavior that is inimical to its own interests. And it would do us well to contemplate the implications for the world if a fundamentally racist nation were to win its bid for global leadership. Would such attitudes mellow? Could they? Or would they instead sow a value system where “diversity” became an obscenity? A thought for the National Day holiday. Enjoy, and see you after the break. This entry was posted in Africa, China. Bookmark the permalink.